Could it be that just one person concocted the whole story about the world ending cataclysmically in 2012, resulting in all the current hysteria? Dr. David Reagan and I recently had the pleasure of interviewing Dr. Mark Hitchcock on the show Christ in Prophecy. Mark is a leading Bible prophecy expert, prolific author who has penned over 20 books on the end times, senior pastor of Faith Bible Church located in Oklahoma, and adjunct faculty member of the Dallas Theological Seminary. He is also a much in demand speaker at Bible prophecy conferences all over the nation. 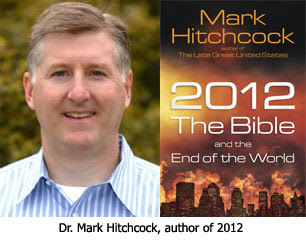 Dr. Hitchcock was invited to answer questions based on a book he has just published about the widespread speculation and even hysteria that the world will come to an end on December 21, 2012. The book it titled 2012: The Bible and the End of the World. 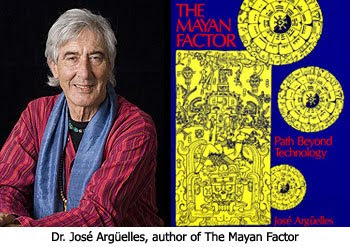 Dr. Hitchcock: All the 2012 hysteria can be traced back to José Arguelles back in 1987 when he came out with his book called The Mayan Factor. He talked a lot about Harmonic Convergence at that time. After all, the real underpinnings of this whole 2012 phenomenon really is based in the New Age. In fact, this has been called by some "The New Age Eschatology" and the end time view of the whole New Age Movement. Just like the other religions of the world all have some view of how things are going to end. 2012 is from the New Age viewpoint. It is fascinating that the Mayans themselves never said anything like Arguelles has, but in popular culture it has caught on. Of course, the movie that is out on this — the most expensive movie ever made on 2012 — is really feeding the 2012 phenomenon. And, I think the other thing that is feeding this is a lot of fear out there today in our culture and a lot of uneasiness. 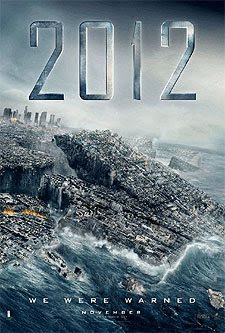 Not one single Mayan academic expert in the world agrees that this calendar marks the end of the world. There's not one. Scientists at NASA and others say a galactic alignment is not going to cause the end of the world in 2012. This idea is all being driven by people from the New Age background. There are now hundreds of books out there on 2012. If you Google "2012 End of the World" you get 18 million links, last time I checked. I mean, that is how much hysteria is out there, and it is really causing a lot of fear and anxiety in the hearts of a lot of people. RG, thanx 4 the Middletown link, good stuff, only a couple of bones to pick with them; 1. A little annoying as it seemed written like at a teen catechism level, and 2. Why does 'everybody' think that Gen. 9:6 is the institution of human government? It's not! EI, glad to hear U have 'The Google' over there... you axed about PTR-??? Why Pre-Trib Rapture position, of course! Just like GB = Globaloney. Didn't mean to go short on you, I sometimes forget that not everybody's as clever as me... ;-D Lol! In my file system I tag every file with a prefix so they just kinda sortta group themselves by topics automatically... That way I don't have to have a mile-long list of tiny sub-folders. In my 'Doctrine' folder I have a couple of simple subs; 'Prophecy', with file tags like PTR- , PD- , RT- = Replacement Theo. [Preterists are lumped in RT]. In '333_777_888' folder; 333- = Trinity issues, 777- = God, 888 = Jesus [since Jesus' name add up to 888 in Greek, 8 = new beginning, resurrection & 3 of them = trinity], HS, & YHVH [self-explanatory]. '666DOD2012' has; 666- = all blatant Marco D'Beast & chip tech stuff, 2012- = 2012, AA- = AlAnon, DOD- = Doctrines Of Demons, ECCP- = Emerging Church-Contemplative Prayer, ETA- = End-Time Apostasy, Ju3- = [Hey EI, it's an easy one... Wanna take a stab at it??? ], RCC- = RCC, RW2DE- = Rick 'UknowWho'-2Deceive the Elect. "RG, thanx 4 the Middletown link, good stuff, only a couple of bones to pick with them; 1. A little annoying as it seemed written like at a teen catechism level, and 2. Why does 'everybody' think that Gen. 9:6 is the institution of human government? It's not! On the link; some of those articles are directed at newbies like me. I have my own thoughts re Gen 9:6 but they probably won't contribute to any meaningful discussion. However, I know a few dispies you could contend with on that issue. There are now hundreds of books out there on 2012. And I try to put Gospel tracts in every one I find. Good idea, SOT! Time for me to do the same thing. As an Auxilary nurse, one sister used 'initialism' with gusto during the 'handover'. Her idea was to be quick, but it took me at least 1/2 hour to work out what she had said - thankfully I lost no patients! "Sot"....now that was just tooooo funny! I am sure "thunder" will get a good laugh over it too. LOL!! Just looked up SOT and see what you guys are on about. Looks like I owe Son of Thunder an apology. No need. It's all in good fun. I was slyly commenting on certain recent posts that, as I read them, start to look like they were typed using the Wingdings font. (Especially some posted in another article).